Baking soda, or nahcolite in its natural form, is part of the natural mineral natron, which is abundant in sodium bicarbonate and has been used since ancient times. Despite being of great help in the household, baking soda offers powerful medicinal properties. “Baking soda helps regulate pH—keeping a substance neither too acidic nor too alkaline. When baking soda comes in contact with either an acidic or an alkaline substance, its natural effect is to neutralize that pH. Beyond that, baking soda has the ability to retard further changes in the pH balance, known as buffering. To improve oral health, whiten your teeth, and destroy bacteria in the oral cavity that lead to cavities, make a paste of baking soda, a pinch of sea salt, and water, and use it instead of your store-bought toothpaste. 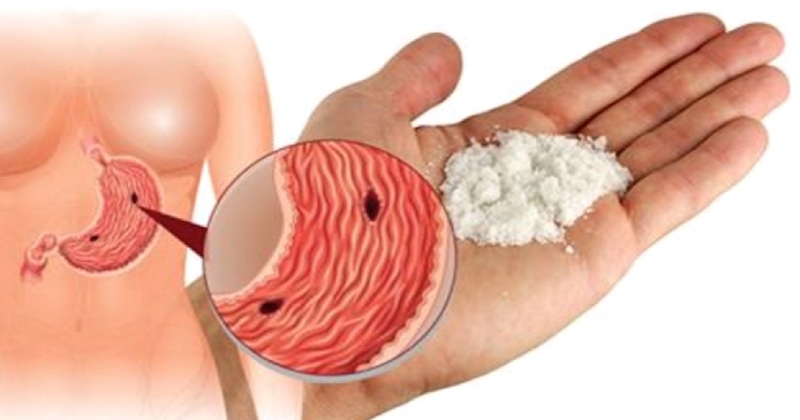 Baking soda is made of 100 percent natural sodium bicarbonate, and it neutralizes the stomach acid immediately, so it relieves heartburn, ulcer pain, and indigestion. Just dissolve half a teaspoon of it in four ounces of water, and drink it every two hours. To naturally relieve the painful sunburns, add half a cup of fine baking soda to the lukewarm water in the bathtub, and soak in it for 15 minutes. You can even apply a mixture of water and baking soda directly on the sunburn. Soak the feet in a mixture of 3 tablespoons of baking soda and warm water, to exfoliate the, remove odor, and get rid of dirt. Mix baking soda with water, and use the paste to scrub the hands, remove odor, and disinfect them. You can use baking soda as a natural deodorant. Just combine it with water, and pat the paste on your body. Make a paste by mixing water and baking soda, and apply it on the splinter, and put a band-aid over it. Repeat a few times daily. In a few days, the splinter will come out on its own. Sprinkle a bit of baking soda into the palm along with your favorite shampoo, and wash the hair as usual. Rinse thoroughly, and it will eliminate any residue from styling products left behind, and leave the hair shiny and stronger. Mix baking soda with water, and apply the paste on the affected area to soothe irritations and the itching. Therefore, it would be wise to have a box of baking soda at home at all times, wouldn’t it?